For Bryan Garrison, a Sous Chef who oversees prepared foods in our Rochester location, the Wegmans journey has been a fruitful one. With years of prior cooking experience, he was looking for an opportunity that promised stability, and upon running into a friend and a fellow chef who worked with us, Bryan realized that joining our team was a move he needed to make. 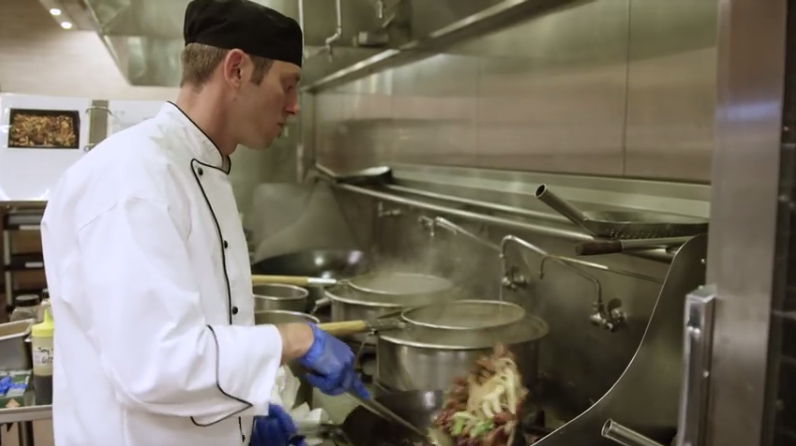 Today, he works alongside fellow culinary enthusiasts who challenge him to grow in his career every day. Learn more about his Wegmans story. What is your current title with Wegmans? I am just six months out of the Culinary Management Trainee program, and I am currently a Sous Chef overseeing my own prepared foods department at our Eastway Store in Webster, NY. What led you to join the culinary team? After moving back to Rochester with my wife, I ran into an old acquaintance who had been working as a chef in the company for years. After spending years working in various private restaurants as a chef, I was looking for a more stable place to work so that I could have more time with family and work for a company of which I felt an investment in its mission. Wegmans was that place. Can you walk us through your Wegmans journey? Coming into Wegmans as an established chef-- already working in the industry for years and having been professionally trained-- it was fun and challenging to progress from part-time customer service and work my way up. "I knew that there was a clear path and progression that I needed to follow in order to achieve my goals within the company, and that was helpful. My mentor chefs and the leaders in the company were always encouraging." One of the unique aspects of being a chef leader in the company is that there really isn’t a “typical day.” While I am always working with my team to ensure consistency of food and quality of product, the variability of working with people and customers to meet their unique needs always presents new and exciting experiences daily. Also, Wegmans is always working to evolve its prepared foods and with that comes new and exciting tasks to stay current and ahead of the industry. One of the highlights of my job is working alongside other committed chefs, who challenge me daily to be a better version of myself, and to work alongside my team who keep me humble. The people, in general, are the heart of the company and they are the best part of working here. There is tons of opportunity! Any vision an employee has for themselves in the company is achievable. That is why people stay here and make a lifetime career out of being a Wegmans employee. While I have been lucky to achieve many of my goals within the four short years I have been working at Wegmans, my future goals are to establish myself in the company as a leader and a great chef known for supporting staff development and challenging the company to continue its commitment to healthy living. My ideal progression would be to advance next to Store Chef and eventually into an Executive position with Research and Development, focusing on supporting our customers with healthy living through knowledge of clean ingredients and alternative nutritional options. I have so many great memories that it is difficult to narrow them down, but mainly having the chance to work across many stores and to be part of store openings has allowed to get to know and work alongside a diverse group of people; that tops the list. Are you looking for a unique career opportunity that allows you to work alongside people like Bryan, who want to help you succeed? Grow with us and love what you do at Wegmans! Explore our culinary openings.